9Mobile data plans and a list of 2017 bundles have been released, the plans support iOS devices, Windows and Mac PC, Android and every other internet supported gadget. 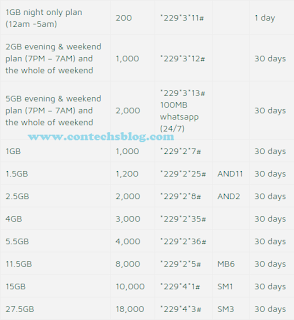 The subscriptions codes and SMS for daily, weekly, monthly, weekend and night plans have been provided below on this post. The plans are expected to be better than the previous Etisalat data plans which they came out from. Let's take a look below to confirm our thoughts and expectations. 9Mobile currently has two daily data bundle plans, they are the 10MB daily data plan and 50MB daily data plan, the first is sold for N50 while the latter is sold for N100. Both are valid for 24 hours but can be exhausted before expiration. To Subscribe for 9Mobile 10MB Daily Data Plan; Dial *229*3*8# or SMS M13 to 229. There is only one weekly data plan on 9Mobile yet, though more may be introduced soon. The plan gives you 200MB worth of data and is valid for 7 days (a week). The price for this 9Mobile weekly data plan is N200. To Subscribe to the 200MB weekly data plan; Dial *229*2*10# or Send an SMS with LCD to 229. 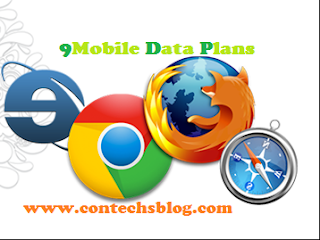 9Mobile has 5 monthly smartphone data plans, these plans are best for smartphones like Android and iPhone, you shouldn't purchase them for a Feature phone. They also vary in data allowance and price but their validities are the same because they all last for 30 days. To Subscribe to 500MB monthly smartphone data plan; Dial *229*2*11# or SMS smarta to 229. To Subscribe for 1GB monthly smartphone data plan; Dial *229*2*22# or SMS smartb to 229. To Subscribe for the 2.5GB smartphone monthly data plan; Dial *229*2*44# or SMS smartc to 229. To Subscribe for the 5GB smartphone monthly data plan; Dial *229*2*33# or SMS smartd to 229. Dial *229*2*55# or send smarte to 229 to subscribe for 11.5GB monthly smartphone data plan. Below are the subscription codes, data allowance, and price for all 9Mobile monthly data bundle plans. Subscription code; *229*5*3# or send 12M to 229. These Night and Weekend Plans below are usable between 7 PM to 7 AM on weekdays and usable the whole of weekends. To Subscribe for 9Mobile night plan; dial *229*3*11#, costs 200 Naira and usable between 12 am - 5 am. 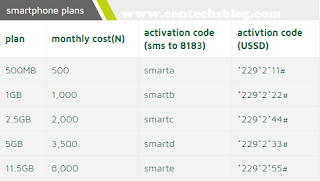 See the subscription codes, validity, data allowance, usability and price of 9Mobile's smartpak data plans in the image below. To Cancel auto renewal on any 9Mobile data plan; Dial *229*0#. For more info visit 9Mobile's Official Website. 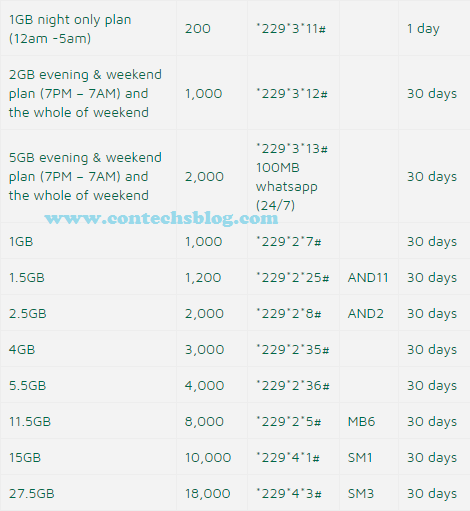 Here I've listed all the 9Mobile data plans and their subscription codes, SMS keywords, validity, and data size. I hope you find it very useful, please take out some minutes of your time and use the share buttons on the page to share this post. Happy Browsing. Thanks for this post. Only that this 9mobile of a name is really confusing. Even when searching it on google only small results show out.